Happy Monday, loves! Just popping in to spread a little holiday cheer! 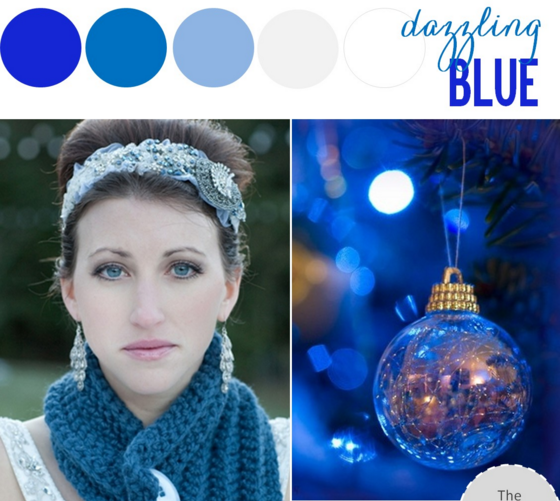 What's blue and sparkly and full of Winter whimsy? Pantone's Dazzling Blue sure does make for a gorgeous wedding palette. Wouldn't you agree? A cozy scarf? A sparkly headpiece? And the prettiest blue Christmas tree I ever did see? This is the sort of stuff that Winter wedding fantasies are made of. Because seriously? What's not to love? And while I have to admit that we're beyond busy over with all kinds of Christmas festivities, I couldn't go without sharing this beautiful blue inspiration with you. Because sparkly stuff is my favorite. So tell me... what sort of holiday happenings are you getting into this season? I sure do hope that wherever you are that you are enjoying the magic of the season! 3 Comments " Blue, Blue, Blue Christmas "
Blue is such a fun color for the holidays. Love the headband in the top left image! That shade of blue is perfect for the holidays!